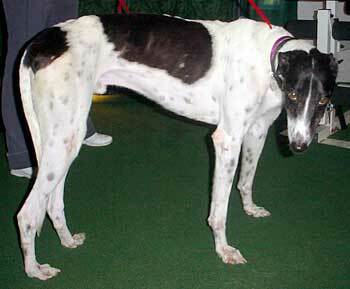 Noah is a 5-year-old white and black male greyhound born January 2001. His registration tattoo is illegible, so his history is unknown. 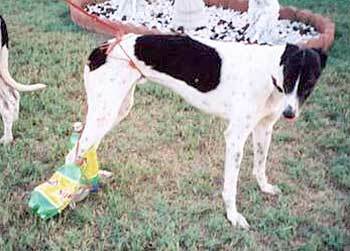 Noah was found along with Moses as strays on FM 1388 between Kaufman and Kemp, Texas, wandering with two plastic liter bottles filled with rocks tied to his tail and around his waist, a very sad sight indeed. Fortunately for both of these boys, they were picked up by a local resident, Donna and her husband, Mike, who are avid animal lovers. Noah, like Moses, was heartworm positive. He has completed his treatment and now is heartworm negative!